A meeting of some 200 worshipers to organize St. John’s Baptist Church occurred March 26, 1922. This meeting was the culmination of a series of gatherings, prayer groups and conferences of Baptists concerned with the progress of their denomination in what was then eastern suburban Charlotte. The church had begun primarily as an outreach of First Baptist Church, but in action that was perhaps to portend events to come, the small group of pioneers determined to accept full responsibility for establishing the new church without help from existing congregations. 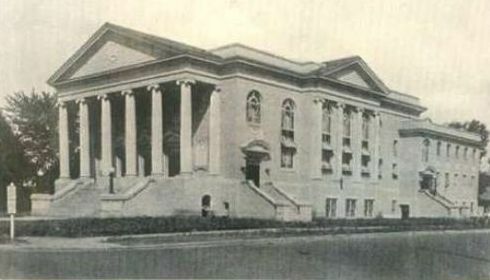 Just four years later, they dedicated the main sanctuary building in 1926. Dr. Joseph A. Gaines and Dr. C. W. Durden served as the first two pastors, leading the church through financial crises and establishing it on sound footing. Dr. Claude U. Broach became senior minister in 1944, and under his leadership St. John’s realized its most significant growth in missions and community ministry. Dr. Broach led the church to develop and nurture the “servant church” concept. Dr. Julian Cave, senior minister from 1978 to 1986, broadened the church’s social ministry and its impact on the community at large. St. John’s completed numerous mission projects such as building a church in Pinch, West Virginia, and constructing homes in Charlotte through Habitat for Humanity. Dr. Thomas H. Graves became the fifth pastor in October 1987. He helped initiate a revitalization of the St. John’s spirit before leaving to become the first president of the new Baptist Theological Seminary in Richmond. Dr. Wm. Richard Kremer served as St. John’s sixth pastor from November 1991 until June 2009. He came to St. John’s after pastorates in Kentucky and South Carolina. He played a vital leadership role in the United Baptist Association, which is a multi-racial, non-geographical association. He worked diligently to expand its mission. In October 2009, Dr. Layne Smith came to serve as Intentional Interim Pastor, leading the church through a self-study. He facilitated the work of the church in remembering and celebrating where it has been and in clarifying its future focus as well as its mission in the world. Dr. Dennis W. Foust became the seventh pastor of St. John’s in August, 2011. He is guiding the congregation in a journey of renewal by building upon its legacy as a creative and progressive ecumenical voice gathering in the revitalized center city of Charlotte and scattering to continue the ministry of Jesus throughout the metro region. We will be faithful to the public worship of God, gathering with the family of the Church to celebrate his glory and remember his grace. We will take seriously the responsibility and privilege of personal Christian growth, diligently seeking to establish and maintain a Christian atmosphere in our homes. We will love and encourage each other in the family of the Church, and admonish each other as occasion may require. Our differences will not separate us but rather increase our understanding and strengthen the bonds of Christian love. We will be faithful stewards, as God has prospered us, contributing our financial support for the Church and its ministries and offering ourselves for God’s work in the world. We will, with God’s help, so live our lives that others, seeing the joy of Christian living, may seek to know Jesus Christ our Lord. We will be a servant church, recognizing the infinite worth of every person and believing that Christ has called us to active involvement in behalf of human brotherhood. Almighty God, Father of us all, witness this Covenant which we make with each other and with Thee. Guide us as we try to do that which pleases Thee, to the glory of Thy Son, Jesus Christ our Lord. Amen.